Community enriching programs and events. A gathering place for all people. Two Rivers Gallery provides a space for emerging Native artists to exhibit work and nurture creativity, strengthening Native art and artistic voices within the Twin Cities. Gatherings Cafe is a small restaurant operated by the MAIC. We have daily lunch specials and can also provide box lunches for pick-up. Handmade gifts by local artists. Beadwork of all types, jewelry, Native music & DVD movies, beading supplies, T-shirts, and greeting cards. 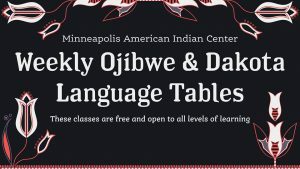 Minneapolis American Indian Center has a variety of programs operating each week. Learn more about the programs here or check out the calendar to find out what is happening this week. The Minneapolis American Indian Center is a community center in the heart of the American Indian community of Minneapolis. It is one of the oldest Indian centers in the country, founded in 1975. We provide educational and social services to more than 10,000 members of the community annually. We preserve and support American Indian cultural traditions through art, youth and inter-generational programs.